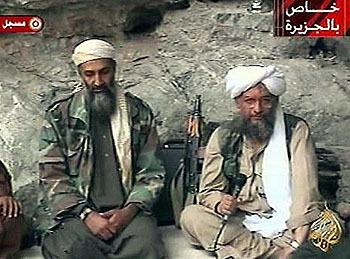 U.S. counterterrorism officials are increasingly convinced that the killing of Osama bin Laden and the toll of seven years of CIA drone strikes have pushed al-Qaeda to the brink of collapse. The assessment reflects a widespread view at the CIA and other agencies that a relatively small number of additional blows could effectively extinguish the Pakistan-based organization that carried out the Sept. 11, 2001, terrorist attacks — an outcome that was seen as a distant prospect for much of the past decade. ….Defense Secretary Leon E. Panetta declared during a recent visit to Afghanistan that “we’re within reach of strategically defeating al-Qaeda.”….Senior U.S. officials from the CIA, the National Counterterrorism Center and other agencies have expressed similar views in classified intelligence reports and closed-door briefings on Capitol Hill, officials said. Something tells me that this is a bit like Zeno’s Paradox: we’re going to keep getting closer and closer, but we’ll never quite get to the finish line and no one will ever quite be willing to say we’ve won and can remove our troops from the fight. Then again, maybe that’s too cynical. Lately we’ve been taking a tougher line toward Pakistan, almost as if we don’t care very much anymore if they kick us out of the country. Well, maybe we don’t. And if we don’t need Pakistan for much anymore, that’s a pretty strong sign that we really do increasingly believe that al-Qaeda Central is nearly done for. Time to move on to Yemen and Somalia.